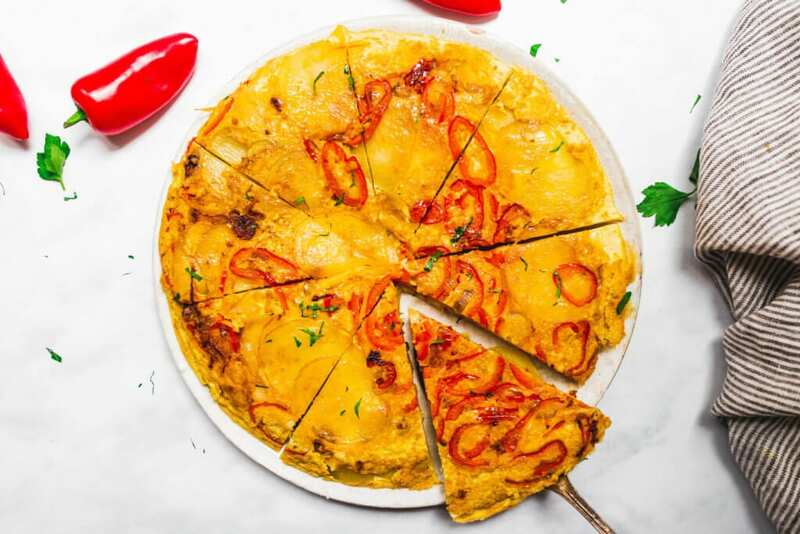 Savory with sweet mini red peppers, this foolproof tortilla Española recipe will be your new favorite brunch, breakfast, or dinner dish. This is not your mama’s frittata, it’s even perfect for a tapas night. 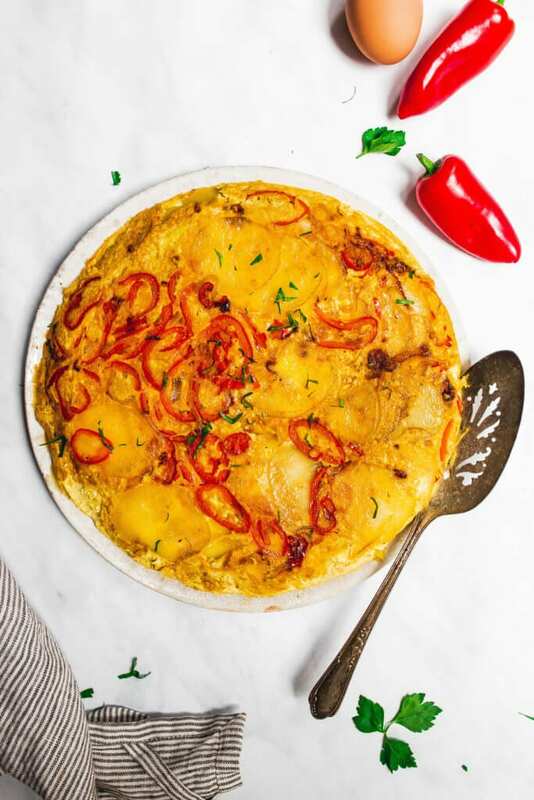 This easy and mega flavorful Tortilla Española is perfect for any brunch or even a meal-prepped breakfast! After my trip to Spain a few years ago, we were lucky enough to attend a cooking class where we got to see how it’s done, a legit, authentic tortilla Española recipe (or, Spanish omelette). 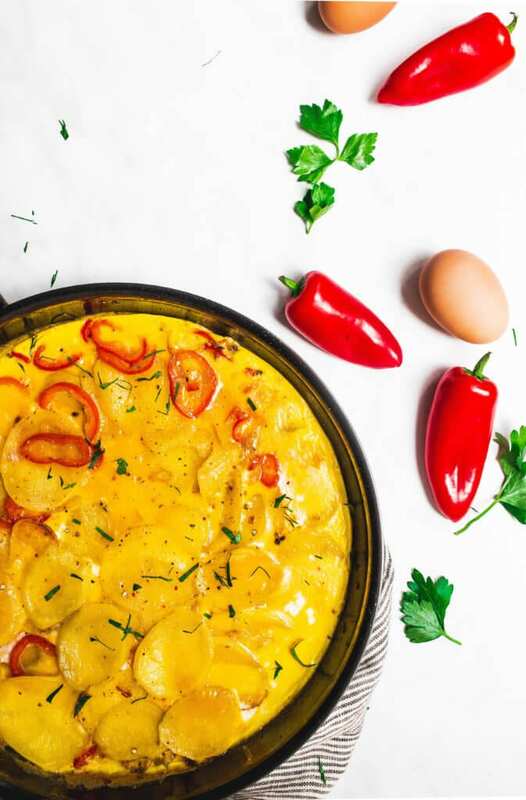 And if it’s one thing I learned, this is no ordinary egg dish… the layers of potatoes, onion and in this case… sweet red peppers make it EXTRA (not your mama’s frittata, people). The care that’s taken with each step, building the flavors as you add more veggies and then finally the eggs before flipping (you got this) is fun and so worth it. Whoever you serve this to will taste all the love you put into it! 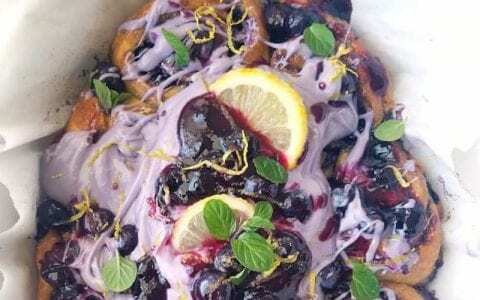 You can also really make it your own with your favorite garnishes and veggies. Adding the sweet red peppers in here give it an extra Spanish flair and flavor that will make you shout, “QUE RICO!”. 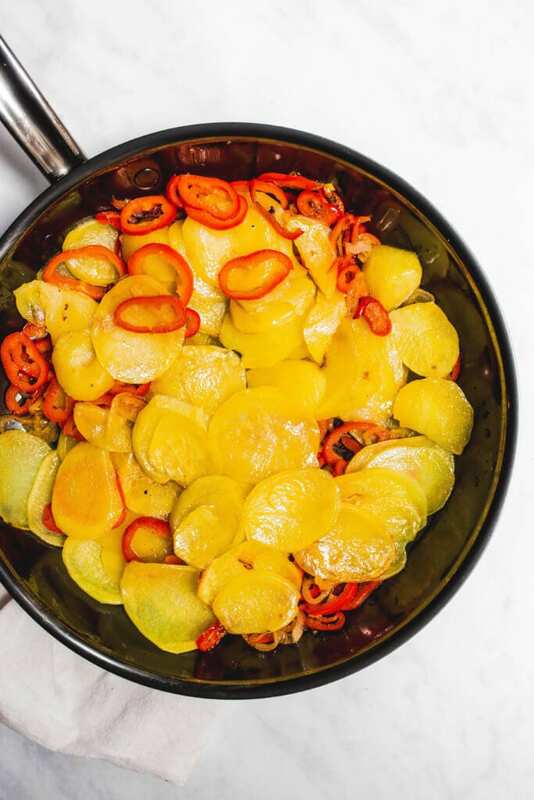 Traditional Tortilla Española recipes will have you essentially fry the potatoes and veggies in a lot of olive oil in a pan. But guys, good olive oil is expensive! I wanted to save a bit of it by lightly baking the potatoes (which take the longest to cook) in the oven on a sheet pan FIRST. This way they’re almost all the way there by the time we are ready to marry up with the veggies and eggs. I saute the bright red peppers and shallots (or you can use your favorite onions) with olive oil in the skillet and add the potatoes after, right before the main event! This shortcut saves time and some precious oil, compromising none of the flavors or textures. I also love finishing it all off in the oven for the most even cooking possible, so there are no surprises when we flip that beautiful creation over onto the plate. So an oven-safe skillet will be your best friend here for this full-proof, but half baked tortilla Española recipe. 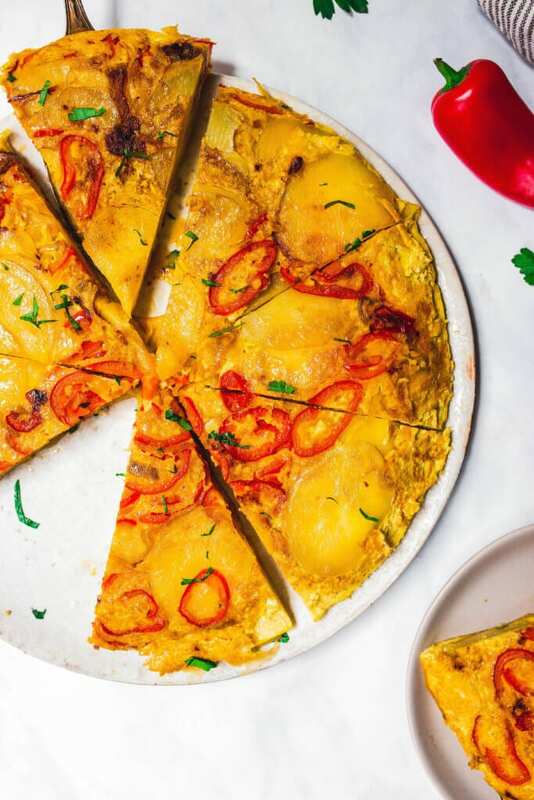 Whether you’re having a beautiful upcoming Easter brunch or cozy breakfast at home, this Tortilla Española recipe will be a new favorite FAST. Serve it with any side salad, bacon, etc. 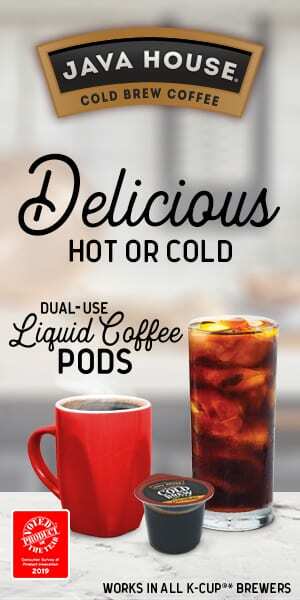 you like or all by itself (because it’s THAT good). Peel potatoes and slice thinly, preferably using a mandolin or slicer to a medium thickness. Make them all the same size to cook evenly. Line a baking sheet with parchment paper and drizzle a little olive oil on top (approx. 1 Tbsp). Add potatoes in as close to a single layer as you can get it and toss in the olive oil. Sprinkle with sea salt and bake in the oven on a middle rack, for 15-20 minutes until cooked (but not crispy). In the meantime, slice shallots and peppers into small rings of even sizing. Remove seeds and stem from peppers and discard. Prep a non-stick, oven-safe pan (approx. 12 inches in size) with the rest of your olive oil over medium heat. Add sliced shallots and peppers, season with salt and pepper to taste and stir frequently with a wooden spoon to get the veggies nice and tender (avoid getting them brown, you can lower the heat if needed). Once potatoes are done, add to the pan and pat all veggies down in an even layer, reduce heat to medium-low for a couple of minutes. Whisk 6 eggs in a mixing bowl until well combined. Season with salt and pepper to taste. 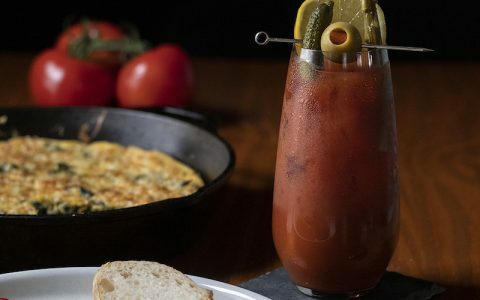 Reduce heat to low and pour eggs over veggies, with a spatula, slide the veggies a bit to ensure the egg mixture is getting into the corners and crevesis. Place your skillet in the oven at the same temperature on a top rack and allow to cook for approx. 8 minutes. Check your tortilla at the 8-minute mark, the top should be set but not too brown. Remove from the oven and carefully slide your spatula along the perimeter of the skillet, getting under the tortilla. Slowly inch your way totally underneath and ensure it’s not sticking. Grab a large plate to cover the top of your skillet, and carefully with oven mitts, flip the pan over onto the plate to reveal your tortilla! Garnish as you wish with more seasonings and herbs, serve or store in your fridge.